What Is Halloumi Cheese or Grilling Cheese? 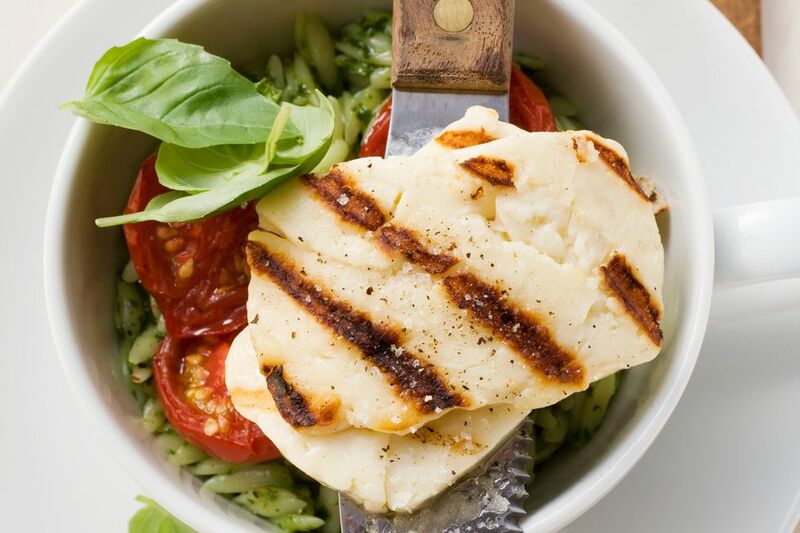 Halloumi cheese, sometimes just called grilling cheese, is making its way up the list of popular food trends—and with good reason. Halloumi cheese is a delicious and uniquely grillable cheese. You can enjoy it in many ways. Traditionally prepared from sheep's milk in the Greek island of Cyprus, halloumi is a soft curd-like cheese free of rennet. It is safe for vegetarians who do not eat rennet. Many similar kinds of cheese are prepared by dairy and goat farmers in Canada and the United States. For legal proprietary reasons, these cheeses are usually called halloumi-style or grillable cheeses. Sometimes they are called grilling cheese or frying cheese, or queso de freir in Spanish. You may find them similar to Greek halloumi, but some people prefer the original. You may not be able to find halloumi cheese in your regular grocery store, but specialty grocers such as Whole Foods will usually carry it. Trader Joe's sells a pre-sliced halloumi cheese. Many smaller co-ops and natural foods stores stock at least one halloumi as well, and specialty cheese shops are also a safe bet. If you can't find halloumi cheese locally where you live you may want to try shopping online for it. Depending on your recipe, halloumi is not usually easy to substitute. Tofu or Indian paneer may be used in some recipes, but it won't be quite the same as halloumi or a similar grillable cheese. What Does Halloumi Cheese Taste Like? Halloumi served plain is firm, salty and a bit rubbery. It is perhaps most comparable to a thick feta in taste with a smoother texture, though the taste of halloumi is certainly unique. But halloumi is not meant to be eaten plain. It should be warmed, grilled, or otherwise fired up in order to really be enjoyed. Cooked, the saltiness fades into a strong savory bite, with a slightly creamy texture. Grilled or fried, it is truly delicious. Think of halloumi as the marshmallow of cheeses: Eaten plain, it's nothing special and even tastes a bit odd, but properly crisped over an open flame (or a grill), both halloumi and marshmallows become beautifully and pleasantly crispy and savory on the outside, sensually melted on the inside and really can't be compared to any other food experience or taste. You've really got to try it. Try halloumi grilled, pan-fried or thinly sliced. Use it instead of mozzarella in a Caprese salad, or serve it with watermelon, as is traditional in Cyprus. If you are ready to try halloumi cheese, you can grill it in a grill pan, or even just fry it up in a skillet with a bit of oil. It's easy to experiment with grilled halloumi cheese or traditional 3-minute fried halloumi cheese meze. You can't go wrong!